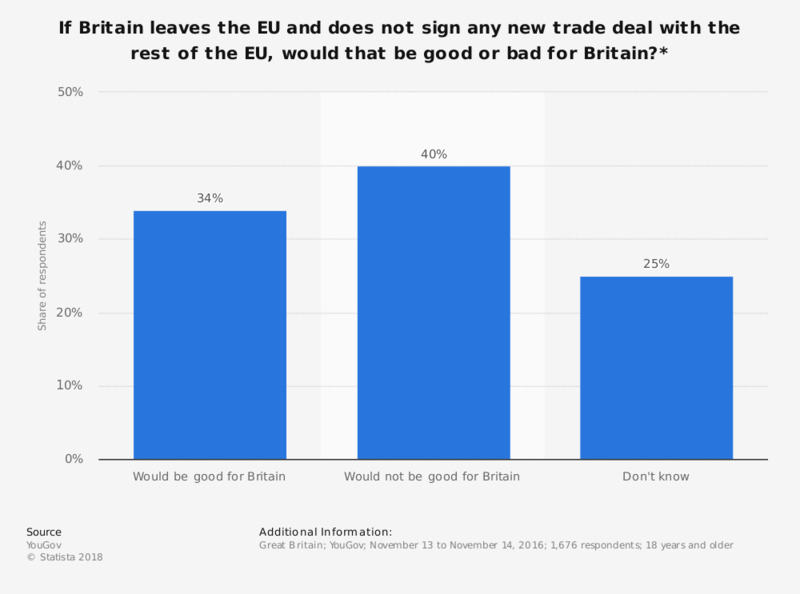 This statistic shows results from an online survey conducted in Great Britain in November 2016 on whether Britain not signing a new trade deal with the European Union (EU) once it has left the EU would have a good outcome for Britain. In this scenario, slightly more people perceived negative consequences. Britain leaves the EU and does not sign any new trade deal with the rest of the EU, relying on World Trade Organisation rules. Britain does not have automatic access to European markets, and there are tariffs or other barriers on many British exports. Britain has full control over our borders and immigration, does not have to follow any EU regulations and does not have to contribute any money to the EU. Do you think this outcome would be good or bad for Britain? When Britain leaves the European Union, how do you think your personal finances will get better or worse, or will they be much the same? Would you be in favour or against introducing passport checks on people travelling between the UK and the Republic of Ireland as part of a new agreement with the EU? Would you say that you are very optimistic, fairly optimistic, fairly pessimistic or very pessimistic about the future of the European Union?